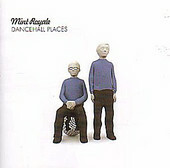 Dancefloor huggers Mint Royale have surpassed that damaging tag of "big beat" and succeeded in producing a second album that is rich in diversity and excitement. Covering everything from house to reggae to rock, the duo of Neil Claxton and Chris Baker, have gathered a scrumptious assortment of treats for Dancehall Places. Using the animated Prince Buster on the aptly titled "Sexiest Man In Jamaica", Mint Royale automatically boost their status as club kings, leaking in an inconspicuous reggae vibe to give the song its just desserts. "Show Me", featuring De La Soul's Pos, raises the bar even more for their brand of house music, giving the album a true dance floor classic. The title track is easily the most surprising moment on Dancehall Places. Stepping out from under the disco ball the duo have adopted as a seat for the album cover, the song points more towards the inactive lifestyle sought once everybody has left the nightclub to go home. Showing the proper way to write a "come down" anthem, it features the overcast vocals of indie songster Damien Jurado, in a very irregular and rather shocking collaboration. Also featured on the track is the exquisite guitar playing of Doves' guitarist Jez Williams, whose blues-inflected guitar chords are tear-inducing. Unfortunately, a couple tracks like the surprising former single, "Anything", and the cheesy 80s pastiche of "Princess" fail to create any sparks, making this album far from flawless. Even though they haven't bettered the sparkling, past single, "Don't Falter", on this album, Mint Royale have certainly created a strong, exotic full-length dance album that buries their overindulgent debut, On The Ropes, at least six feet under.